Welcome back from lunch, good people. As always, SMX laid out a great spread with food fit for kings and… okay, you got me. I totally just ate popcorn. And I’m going to get more tomorrow. And possibly between sessions. But enough about my butter and salt addiction, we’ve got conversions to talk about. 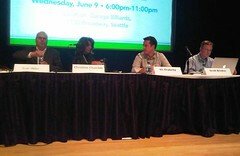 Our moderator this session is Chris Sherman, Executive Editor, Search Engine Land, assisted by Q&A moderator Duane Forrester, Senior Program Manager SEO, Microsoft. Christine Churchill is up first. She’s talking about linking analytics with AdWords. You should link your Google Analytics and AdWords account, which will provide you additional reports that can provide critical insights to allow fine tuning of your PPC campaigns. It also helps you define custom reports. 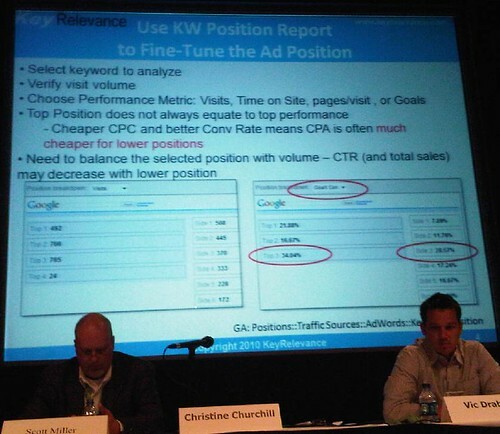 Paying attention to your analytics helps you determine which position is really the best for your ad. Once you’ve linked your account, you’re able to see which position your ad was in when it was clicked on (KW Position Report). Make sure that you have a big enough sample size in order to ensure that you’ve got enough data. At least 100 clicks. Once you know which position is the best, you can put in position preference. This is enabled at the campaign level. Put it in as a range, rather than a specific locked in position. Do it on your prime or core keywords instead of trying to do it for every single keyword in your account. This is a CPC not a CPA tactic. Google Analytics allows you to do advanced segments. It’s an easy way to identify and better understand your best converting visitors. Refine by cities, regions, languages. Population based on type of ads (or exclusions). By first time vs. repeat visitors. Segment by where they came from. Sample question: Is early morning PPC worthwhile? To find the answer, check the behavior of visitors in the early morning, from 2-5 in the morning. They set up the segment and discovered that those visitors converted at 15% instead of the average 10%. You can set up reports and look back in time, not just forward. Very good for determining past events. You can also combine custom reports with your advanced segments, which is like analytics on steroids. In summary, AdWords provides lots of tools and reports for optimizing PPC conversion performance. Vic Drabicky is the next up. He acknowledges that it’s after lunch and thus we’re all sleepy. Hee. You can look at optimization two ways: pre-visit optimization and post-visit optimization. He’s focusing mostly on pre-visit optimization. It’s not about getting every click, it’s about getting every profitable click. 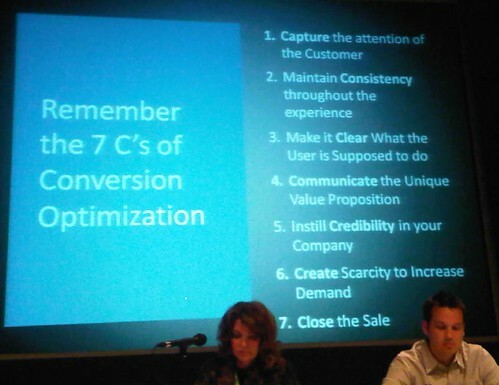 Define a “conversion” and its value before optimizing. It’s not just making a sale. Neiman Marcus has 10 different conversion points on every single page of their site, not just buying something. You need to determine what brings value to your business and prioritize these things. Analyze the revenue each conversion point drives: immediate value, residual value, lifetime value, incremental value, other marketing channel value. Apply the values to your existing marketing campaigns. Educate your internal teams on the value of multiple conversion points. Your conversion problem might not your conversion; it might be your marketing. He did a search for [men j. crew] and got an ad that looked appropriate. When he clicked on it, it brought him to a page with children’s clothing and no reinforcement of the offer. He clicked back and found a different ad that did take him to a men’s clothing page, doubling the marketing cost. What did J. Crew do wrong? Fixing your marketing is easier than changing your site. 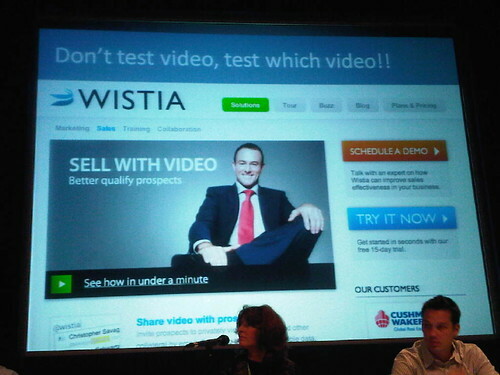 Conversion rate starts with the click, we only want the profitable clicks. The conversion process is not linear, organized or simple. 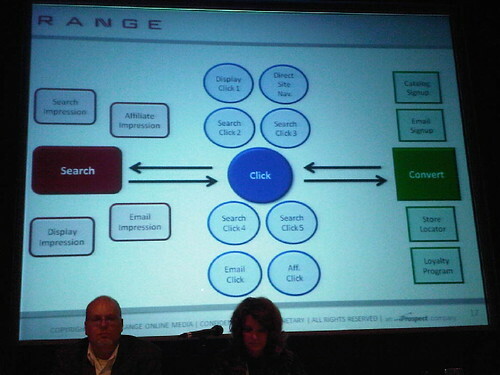 It’s not just Search -> Click -> Convert. Track customer paths to conversion. Find marketing/site bottlenecks and eliminate them, expand upon successes. Broaden your data horizons and let the data guide. Expand the number of conversions you report on. Add bounce rate as an evaluation metric. 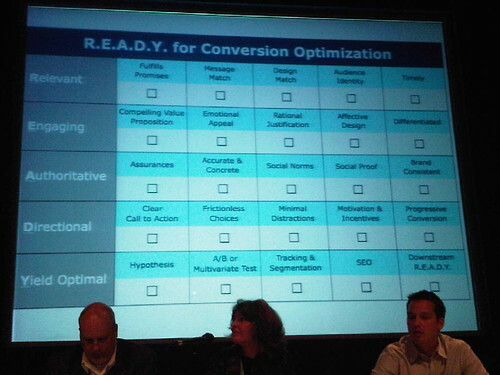 Optimize on conversion paths. Scott Brinker is up next. He wants to know if you’re READY (relevant, engaging, authoritative, directional, yield optimal). Also his slide has a picture of a rocket, for some reason. I think it’s a Saturn 5. If you make a promise, keep it — always. Message match: continuity, specific focus, echo the same language, reinforce key ideas. Audience identity: “This is for me.” Speak in their vernacular, call them by name. Visitors should identify with the content. Timely: Everything is up-to-date. Fresh, not stale look. Call to Action: what do you want visitors to do?, is it reasonable? TEST: A/B and multivariate, if you’re not testing you’re wasting opportunities. Downstream READY: make sure that your handoffs are smooth, don’t lose the event. Scott Miller is up next and I may or may not make it through this. He tells a quick story about a professor he had who had a theory that British accents made you seem smarter and got more respect. So he taught the class with a British accent. Recently they had a client who tested British vs American accents in their video. More people watched the video with the American accent all the way through. You should always test alternate videos. Use a conversion proxy if you don’t have enough traffic. Landing pages are only the 50 yard link of conversion for many sites. Don’t be afraid to go deep. Going deep is sitewide optimization, checkout flow testing, credibility enhancement, change design/CSS, repeat/reinforce search ad or landing page offer, maximizing event yield. For example: is the security seal worth the money? They tested a real company versus a mock logo versus none at all. The brand name seal worked the best, the no seal was better than making up their own seal. People will share more information when they feel safe. Make sure you’re cognizant of experimental noise. I’m glad you found the liveblog useful. I always feel bad when I’m trying to keep up with someone fast. I miss so much good information!